From the IEP Wizard Quick Resume Menu, select IEP Wizard Transportation. Select Yes to indicate that the student requires specialized transportation or No to indicate that the student DOES NOT have specialized transportation needs. 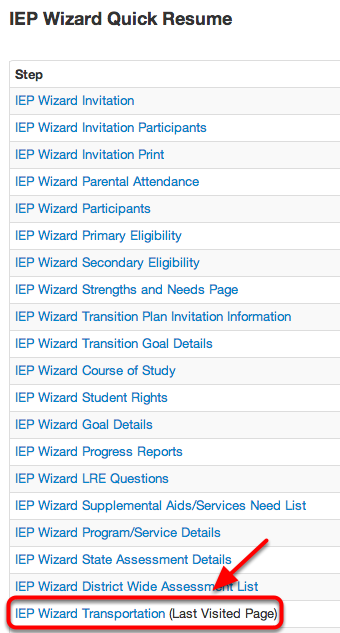 Note: Selecting No will automatically take you to the IEP Wizard Nonpublic School Questions page. For more information on how to complete the IEP Wizard Nonpublic School Questions page see the, "Non-public School Enrollment Statement" lesson in this manual. Selecting Yes will automatically take you to the the IEP Wizard Transportation Details page. 1. In the provided field describe the student's transportation needs. 2. 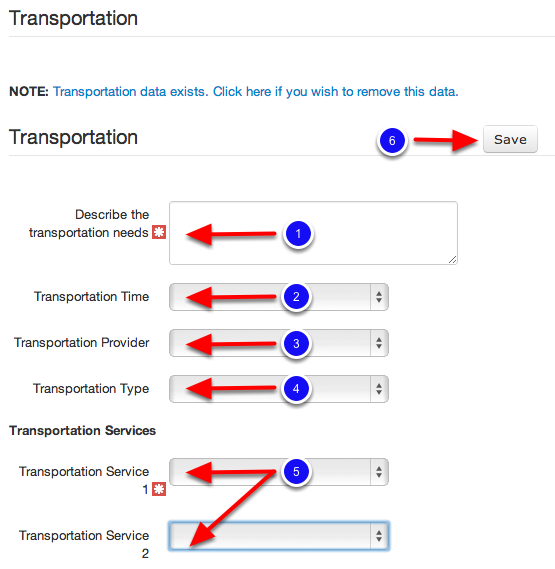 Select the required Transportation Time from the drop down menu (i.e. Full Day, Morning Only, Afternoon Only, or Other). 3. Using the drop down menu select the Transportation Provider (i.e. Parent, Private Carrier, Local District, or Other). 4. From the drop down menu indicate the Transportation Type (e.g. Regular Bus, Special Bus, Special Bus with Lift, etc.). 5. From the drop down menus select the Transportation Services (e.g Seat Belt, Lift and Wheelchair Station Required, Restraint Harness, Bus Assistant, etc.). You are now ready to complete the Nonpublic School Questions portion of the IEP. For more information on how to complete the Nonpublic School Questions section see the, "Nonpublic School Enrollment Statement" lesson in this manual.